Forrest Snow – Once and Future Prospect? In June of 2010, the M’s drafted a local kid out of the University of Washington in the 36th round. Not many paid attention, and it’s not like a glance at the UW stats would’ve given you cause for optimism. In that 2010 season at Montlake, Forrest Snow posted an ERA of 6.30, which sounded terrible, but adding in 13 unearned runs pushed his RA/9 8.11. And yet, he was a local product with a great pitcher’s frame (he’s 6’6″) who sat around 90-91mph. Moreover, he hadn’t been pitching all that long – only a few years in high school after he grew too tall to continue catching. After hitting pro ball and professional strength and conditioning programs, he blossomed, garnering rave reviews in the 2011 Arizona Fall League. After a trying 2012, he bounced back in 2013 but a 50-game suspension for “a drug of abuse” resulted in lost time in 2014. Despite a somewhat rough finish to this season, Snow pitched well enough in June/July to put himself back on the (admittedly crowded) list of hopefuls for a bullpen job in 2015. He’s also a 40-man protection candidate this year. I spoke with him at Cheney Stadium last week as he prepared to finish the season and then head to Mexico for winter ball. MW: You weren’t terribly successful at UW, and then as soon as you hit pro ball, the results were there. What happened at UW? Or, what happened after you signed? Snow: Pitching at UW was a great experience. I’d been drafted out of HS by the Mariners, and decided I wasn’t ready. I’d only been pitching off a mound for two years. I needed to learn how to attack hitters, work counts, etc. At UW, I learned how to work hard and how to work as part of a staff. However, I didn’t really have a role. At times I was a reliever, at times a starter. That carried over to pro ball. Much my success can be attributed to that experience of being a utility pitcher. The Mariners thought I had the repertoire to continue in that role – starting or relieving. Do you prefer one role or another? No, I just love having the ball and throwing it at a catcher. I grew up loving the game and loving the Mariners, and any role they see for me, I’ll be more than happy to work 100% at it. In college, was your velocity the same – low-90s fastball – or did you get a jump after signing with the M’s? My first few years at UW, I was 89-92, and then junior year I was more 91-92 because I gained some weight. After signing and starting the M’s strength program, I was working harder, and by 2012 I was weighing in at 225 and ended up touching the mid 90s. After that, I’ve learned that “foot on the gas” approach all the time just wasn’t right for me – I’ve learned to pump the breaks and take a bit off and use more movement. Your fastball’s always had a lot of horizontal movement, despite being a four-seamer. Was that always the case? Was there a mechanical change to produce that? My arm angle’s been pretty consistent since I started; it’s gradually gotten more over-the-top since high-school, but I’ve focused on putting a lot of pressure on my pointer finger, which helps with pronation, and it produces a good riding fastball. I’ve wanted to add a sinker or a two-seamer, something with a lot of vertical depth, to no avail…yet. It’s still on the back burner, I’ll work on it this off-season and see if I can develop another weapon. In 2011, you pitched for four different teams, culminating with the Peoria Javelinas of the AFL. When you got the AFL call, what did you think? Were you surprised by that assignment? Did you know about the AFL? I was surprised; I got the call in Tacoma – Daren Brown told me I’d be heading down to the AFL. I thought it was an instructional league. Once I get down there, it’s this collection of top prospects and guys who are climbing the ranks quickly. I didn’t think much of it when I first heard about the assignment. No, I was doing the same thing – a few starts, a bunch of relief appearances. More of that utility role. So back then, October of 2011, you had some success, and you were getting written up a lot. Geoff Baker did a story, Kevin Goldstein (now with the Astros) said at Baseball Prospectus that you were one of the better prospects no one had heard of. Did you hear about that stuff? Were you aware of all of the extra attention? You know, my mom’s the one who pays attention to that stuff. I focus my attention between the lines. After leading the fall league in ERA, there was even more chatter, but I had a job, I was moving up the ranks, I just wanted to keep moving up and make the big leagues. I don’t care about attention. There were a lot of expectations on you coming into 2012. Did that change how you prepared for the season? I’d been used to flying under the radar, and clearly there were more expectations then. That didn’t change my approach at all, I still had a lot of fun at big league camp, I was still a relaxed/happy go lucky guy, that’s just my style of baseball. Breaking camp as a AAA starter, that was a bit different. I’d generally come out of the pen, or done a bit of everything, and then I had to learn to be part of a rotation, and having a routine I could stick to. That was great, but I didn’t understand what pitching in AAA really meant. For a full season, I just didn’t get it. What happened? What accounted for your struggles in 2012? I lost a bit of confidence early on, and struggled finding the zone. If you can’t find the zone in the PCL, you’re going to struggle. As far as adjustments I made, as soon as I got sent to AA, I started pitching solely out of the stretch, simplifying my motion, and just attacking the zone. The whole bullpen mentality was great for that – coming in and just attacking, and throwing the kitchen sink at hitters instead of trying to pace myself. That’s something I’ve learned to improve on this year, taking it one inning at a time with a bullpen mentality (that may be why I’ve only been going 5 innings recently). In 2013, your walk rate came way down. Was that all mental, or did a coach give you a tip that really helped? It was really about having confidence. I started out in AA, and it was a bit confusing for me. Over the courst of that year, my confidence rose back to that 2011 fall league level. I was pitching out of the pen, came up and made a spot start in Tacoma, went down, came back up… It’s interesting. It’s hectic, it’s day to day, you never know when you’re coming up, when you’re going down, what role. You had a lot of success down the stretch, especially in Tacoma at the end of 2013. Then comes the suspension. When did you know, and what was going through your mind? We had a drug test at the end of July, the second day I was back in Jackson. I had my suspicions that that would result in a positive. I was trying to focus on the baseball, and whatever would happen would happen. A week after the season, I got a call, and immediately jumped to action. I apologized to everyone I needed to. I signed up for an outpatient rehab program that was recommended by the league – 8 weeks of sessions, three days a week, three hours a day of group therapy. It was extensive. They really talked about the rules around the whole employee-employer relationship, and we talked about some of the issues – the different rules around 40-man testing vs. minor league testing, the new legal environment in Washington, etc. I made a mistake. I really wish I could have those 50 games back. Did that give you some extra motivation, or were you worried that the M’s might actually release you in the aftermath of the suspension? Immediately, I was a bit skeptical..I was worried that something like that could happen. But I’ve gained the trust of this organization. Whether that be by working in the community, coming to work every day on time, always giving 100%, whatever. I have a lot of supporters in the org, and they have my back. They understand people make mistakes, and they learn from them. They understood immediately that I’d try to take as many positives that I could from it. I ended up working on a number of things in extended (extended spring training) that I might not have been able to work on if I started here. I’m entirely thankful to the Mariners for sticking with me and giving me that chance, and I’m not going to let them down again. To be honest, it’s more that I never know when I’m going to pitch that sticks with me. My first year, I didn’t know when I’d pitch – you’ve got to be ready every night, you could pitch back to back days. You never know. That’s what I love about the ‘pen. There was a start I made when Erasmo got called up, and half an hour before, I was notified I was going to pitch. I treated it like another relief outing, and five scoreless later, you know? I’m focused on finishing the season strong, and being a part of the rotation now, it’s been tough to stretch my pitch count out. Going from 3IP max to trying to go 6-7IP. However long I’m out there, I try to keep the team in the game, and put up as many zeroes as I can. You throw basically three pitches, FB, CH, Curve? It’s four now. I had a slider in HD, and over the past year – year and a half, I’ve turned it into a cutter. It’s got a short, late break, and I throw it in the mid 80s. It’s been an equalizer for me, something I can throw behind in the count, and get poor contact, miss a barrel when I need to. Mostly for righties, and I expand it to lefties with two strikes. The FB/Ct combo to righties, and the FB/CH combo to lefties mostly, and then I mix in a curve when I need to. Are you throwing as many curves as you used to? Two years ago, I was working with Dwight Bernard, and I started spiking my curve ball, and I started to throw it harder, and more consistently lower in the zone. My old curve had a tendency to hang once in a while. I’ve been developing it over the past year, and it’s been a good finishing pitch, or to get ahead in the middle innings when you start trying to pitch backwards. How do you use your fastball? With your height, do you target the knees, or up in the zone? It depends on the day and the team I’m facing. I like to use my frame and get as much downward plane as I can, but again, it’s a riding fastball, really good backspin. Some say it’s got some rise. Some outings this year, I’ve heard from hitters that my 92mph looked like 96. It’s deceptive, and I just try to stay fluid and explode out. I’ve got to elevate at times, and use it to my advantage. You mention that you get a lot of backspin. Do you look at data on that? I know they’ve got Trackman here at Cheney, and you know they had pitch fx in Peoria. Is that something you WANT to look at, or do you let the hitters let you know how your fastball’s doing? To be honest, the first judge is the hitters swings that night. Whether they’re late, or on time depending on where I’m locating in the zone. We had pitch fx in the AFL and the backspin stuff looked great, but that doesn’t change how I throw it. It’s good to know those things, but it doesn’t really change how I work on it in the offseason. I’ve always wanted to get into a room with like dry ice or smoke, fill the room with it, put some very slow-motion cameras in there and really see what that spin looks like. Like, the turbulence in the smoke as the ball passes through it? Yeah, that’d be cool. Gotta talk to sports science. What are you working on now, especially given you’re one step away? This offseason’s big. Regardless of what happens, and this is a protection year for me, I’m going to go play some winter ball. I figure I lost 50 games due to the suspension, and I owe the Mariners 50 games of innings. If they’d like me to stay a starter, I’d like to work on my wind-up and stay consistent without men on base. Other than that, just pound the strike zone, and get ahead. The secondary stuff’s where it needs to be, so it’s more about getting used to a starter’s routine. Mexico – Hermosillo, they’re one of the top teams there, and I’ve heard it’s a great place to play. I believe it starts right at the end of September, maybe the beginning of October, and I’ll play as long as they let me. You’ve played a lot of different places – Alaska, Minnesota? I missed the Northwoods league; I was going to go, but then I signed with the Mariners. I played in Bend, OR and then in Alaska. That was a blast. Why was it such a blast? What it do for you? The scenery, the wildlife, the competition was great, I had some friends on the team I’d known from travel ball in high school. You’re a local guy – you got to start in Everett, and then play in Tacoma for parts of three years. Your family can come see you, there’s familiarity – are there some downsides to that too? There are no bad things about playing for your hometown team. It’s exactly the situation I’d want to be in. There’s comfort in being in a climate you know, and then being able to drive up the road and get home-cooked meals, sleep in your own bed, pet your dog, hang out with your family and invite folks to games, it’s a great situation. I’m blessed to be part of this organization. 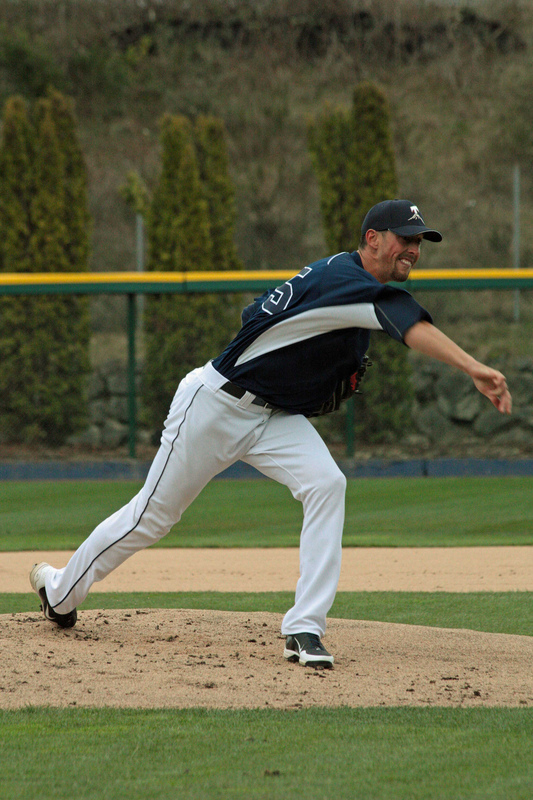 Did that ease your transition to pro ball – starting in Everett? It did. Late rounders don’t have tons of leverage, but, I wanted to make sure it was a fair deal, but as soon as the scout said, “You’ll be starting in Everett” I was like Where do I sign? It’s been a fun ride; it’s not over yet. I’m still working hard, and hope to be playing in Safeco very soon. Snow was great out of the pen this season, but you can understand why the M’s keep pushing him to the rotation. First, they’re clearly thinner there in the MiLB ranks than they are in the bullpen. Second, he’s now throwing four pitches, and the change-up has helped him avoid platoon split problems that doom starting for many. Still, he shot through the system as a reliever and seemed to thrive on not knowing when he’d be used next. If the M’s don’t protect him, it’ll be interesting to see what happens. The guy who put him on the prospect map back in 2011 now heads up the pro scouting group with the Houston Astros. The M’s face an offseason of increased expectations, and a window that looks closer now than it did a year ago. Thanks to Forrest Snow for a candid interview, and thanks to the Rainiers for helping me set it up. Nice interview, marc. I like his idea of throwing through smoke. And it’s interesting to learn the development issues from the perspective of a player. His idea that he had to learn things at UW he wouldn’t have learned in the low minors is intriguing. Marc, that was fantastic, thanks so much for providing such a great writeup, and to Forrest Snow for providing such an excellent interview. I’ve followed Forrest through his time with the M’s and have hoped he has the right stuff to make it to and to stick in The Show. He has the perfect name if nothing else. Nice interview, I wish him well. Looking forward to seeing him next Spring in Peoria. Another quality arm in the rotation is always welcome. Thanks to Marc for the nice interview, and to Forrest for the forthright answers and info! Marc, that was awesome and I really enjoyed it. Thanks for getting it done. Thanks to Forrest for taking the time! Yes, great interview. Looking up Forrest Snow on b-r, it says that he went to the Lakeside School, which has produced twice as many Microsoft co-founders as it has major league ballplayers (John Leovich, with 1 game and 2 plate appearances in 1941).